Udupi, June 30, 2017: At the CMC meeting today, road construction topic was discussed. The counsil members discussed over the Padigar Road construction and its completion. During the meeting, Geetha Shet brought with her some of the locals from her ward. But other councillors objected to it. 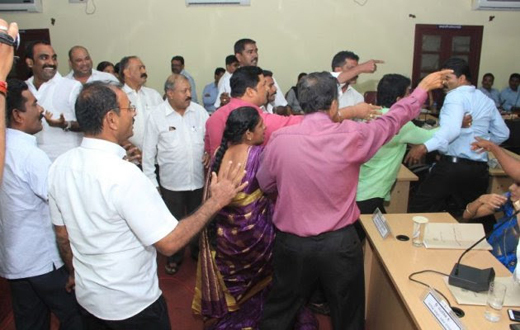 The councillors then mistreated and manhandled Rony D’Mello who came to the meeting hall in support of corporator Geetha Shet. Police were later called and D’Mello was taken to the hospital. The Councillor too had made mistake by getting stranger into CMC. wasn’t she aware of the law? How can CMC members misbehave with any visitor . It shows how cheap you people are?